If you've ever seen the movie Mystic Pizza, then you've seen this bridge! People come from all over the world to visit Mystic Seaport, go to the aquarium, and to marvel at this historic bascule bridge! 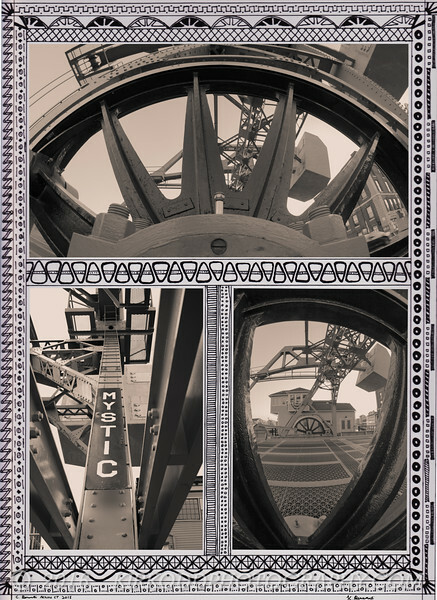 This is our most popular Mystic Drawbridge piece of art. This piece is a composite of three individual pictures of the bridge. In the upper picture, the primary drive wheel of the bridge dominates the view, with the counterweight truss structure visible through the spokes. Taken with our convex wide angle lens, the curve of the drive wheel is accentuated. For the bottom-right image, we used the same lens to capture the view across the bridge of the actual bridge control house, poised in an ideal spot to monitor traffic along the historic Mystic River. Shooting through the spokes with the fish eye lens makes a "frame within a frame" effect. The picture on the bottom left (taken with a standard lens) is the view that visitors to Mystic see as they look up the bridge trusswork while walking by (in case they didn't know, they are in Mystic!) The border work was hand drawn in ink by Kirsten. She used a curvy gratework and gear motif that is reminiscent of the historic bridge itself. This image is a perfect souvenir from Mystic, CT, and will be our centerpiece of the Mystic Art Festival. It also would go well with New England themed decor. Mystic, Connecticut is a beautiful little New England town with many attractions. The Mystic Drawbridge is a historic counterweight bascule bridge that spans the Mystic River in downtown Mystic, CT. Built in 1920 by the J.E. FitzGerald Construction Company of New London, CT, this bridge is a historic landmark and a centerpiece of the Mystic community.